Captain, Corte Madera Volunteer Fire Department, Ltd. The photo above was taken in 1967, one year after the new Corte Madera Public Safety Building was completed. Jack is pictured at the lower right, in front of wife Diane Nelsons' Uncle Bill Nelson, and her father Chief Frank Nelson is at the far left, standing. 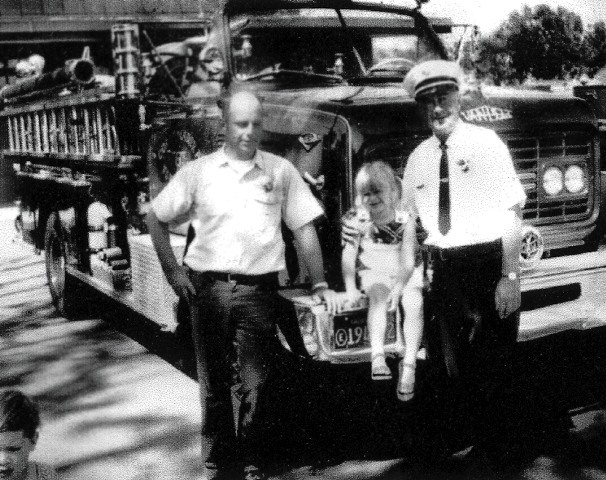 Captain Jack W. Forster and his youngest daughter Pam, along with father-in-law and Fire Chief Franklin L. Nelson at a Corte Madera VFD Open House in the late 1960's. They are standing in front of the department's open cab, short wheelbase 1966 GMC Van Pelt 1000 gpm pumper. Jack William Forster Of Corte Madera passed away peacefully at home on October 25, 2011 surrounded by family, following a two-year fight with multiple myeloma. Jack was born May 30, 1934 at Cottage Hospital in San Rafael, the son of Gertrude and Raymond Forster. He is survived by his loving wife of 56 years Diane Nelson Forster; his younger brother Thomas (Marti) of Orland, daughters Lynn Sogoian of Red Bluff and Pam Rosa (Kevin) of Petaluma; and sons Thomas Forster (Maureen) of Blairsden, and Dan Forster (Ania) of Sydney, Australia; ten grandchildren, and four great-grandchildren. He was pre-deceased by his older brother Raymond, and his parents Raymond and Getrude Forster. Jack was raised in Fairfax and was part of the first graduating class of Drake High School in 1952. A Boy Scout, he helped build the Tamarancho Boy Scout Camp in the hills above Fairfax. After serving in the Coast Guard, Jack went on to start a successful commercial landscaping business that later evolved into Forster & Kroeger Landscape Maintenance, with partner Chuck Kroeger. His life was filled with quiet leadership and service to his community, family, friends and neighbors. He was a long-time and very proud member of the Corte Madera Volunteer Fire Department Ltd., serving as President and then Secretary for many years, while holding the rank of Captain. He was proud to serve under his father-in-law Chief Frank Nelson, and made many life-long friends in the very tight-knit fire family. "My father was my idol and mentor," said son Tom Forster, "I always wanted to grow up to be the type of person he was - kind, generous, and hard working, including being a very devoted member of the fire service." Jack was in the third generation of five generations of firefighters in his extended family, starting with Battalion Chief Charles Thaler of the Oakland Fire Department, multiple members of the Nelson family including father-in-law Frank Nelson of Corte Madera VFD Ltd.; cousin Ron Nelson who retired as Chief of Burney FPD; son Tom Forster serving with Larkspur, Skywalker Ranch Chief, and Plumas Eureka FD Chief; son Dan Forster volunteering with Larkspur FD; and grandson Chris Martin, now serving in the Red Bluff FD as a Firefighter/Engineer. Jacks' extended family members have totaled up over 270 years of service in the fire profession, and still counting. He served on the Corte Madera Planning Commission, and was a long-time member of the Central Marin Rotary Club. ​He was a faithful member of Redwoods Presbyterian Church in Larkspur for over 55 years, serving as an Elder, a church-school teacher, and volunteer "Jack-of-All-Trades" at the facility. Jack loved helping others and also enjoyed camping, gardening, carpentry and wood carving, creating stained glass, taking long walks with Diane, swimming, good food, and BBQ's with family and friends. He loved animals, and had many cherished pets over the years, most recently his beloved border collie Sadie. He and Diane traveled extensively, including favorite trips to Australia to visit son Dan and his family. ​The family extended their sincere and heartfelt thanks to Hospice By The Bay for their expert and loving care during his last few weeks at home. A memorial service was held at Redwoods Presbyterian Church in Larkspur on Saturday, November 19, 2011.